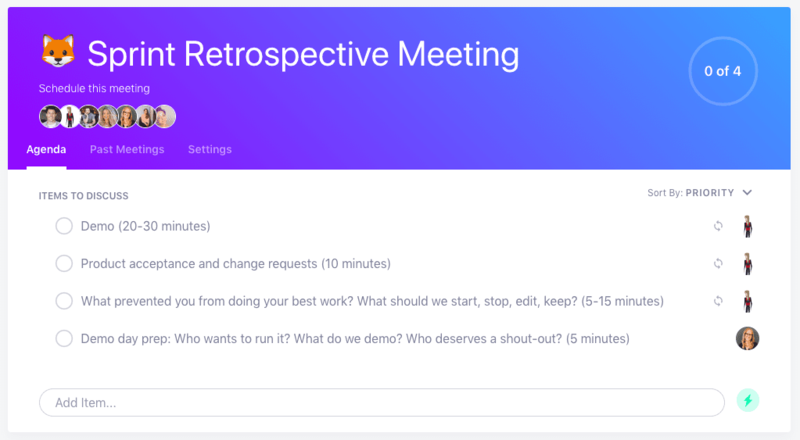 Sprint retrospectives are a type of agile meeting or scrum ceremony that allows the team and scrum master to reflect on process and collect feedback, and use that information to fuel improvements for the next sprint. Retro meetings are held at the end of the sprint and can take anywhere from one to two hours, depending on the size of your team. Click here to jump to the SoapBox sprint retrospective meeting agenda template! During this time, your team will show and tell what they’ve worked on in the sprint. This is an opportunity to knowledge share with the team as well as celebrate wins. Expert tip: Make sure you have the right tech in place to have everyone share their screen seamlessly. There’s nothing worse than wasting 10 minutes messing around with dongles at the start of every meeting. With any project, it’s important the Owners have buy-in and acceptance of the finished product. This is the time where scope changes and reiterations will be communicated, resulting in changes requested for the next Sprint. This is a round robin discussion where everyone is encouraged to contribute to at least one of those three items (start, stop or edit). ⚡️ Expert tip: Stop this agenda item from monopolizing the meeting by giving your team a place to share issues and add comments throughout the sprint, when they’re top of mind (SoapBox does that!). This keeps the conversation during the meeting focused on making decisions, rather than sharing context. Reserve a few minutes at the end of each sprint retro to prep for your demo day presentation. If agile or scrum ceremonies are new to you, our demo day is a sprintly meeting with the company where each team showcases the highlights and work completed in their sprint. Use this time to decide who and what will be presented to the company or wider team. In a meeting like this one, where you’re collecting feedback and discussing potential roadblocks, it’s crucial that you take meeting notes that everyone can access after the fact. Assign a note taker, if needed, to keep track of the conversation. Meetings are where decisions and a plan to move forward are made. It’s important to document what those next steps are, giving clear accountability and ownership, making progress on what matters as a team. You can spend a lot of time harping on known issues with the product (or project, or site, or app) that aren’t getting fixed any time soon – that’s a waste of time. Encourage the team to focus on productive feedback and solutions, not venting. One final thought: while sprint retros are typically thought of as for support of product and engineering teams only, they can be beneficial to any team looking to reflect on the work that’s been done, celebrate wins and improve upon the next project. Try implementing it with your team, and see what happens!